Bulnes is located in a calm, agricultural region, but the aftereffects of the massive earthquake of 2010 continue to affect the lives of hundreds of families. Many lost their homes, their jobs, and many left the region because their livelihoods had been destroyed. The infrastructure is being rebuilt, but overcoming the trauma will take a while yet. The small city of Bulnes, in the Ñuble Province of Chile, has a population of just over 20,000 and is located in central Chile. The region has warm summers and very cold winters. Its main economic activities are agriculture, forestry, and the production of artisanal crafts such as pottery. In 2010, a massive earthquake measuring 8.8 on the moment magnitude scale hit Chile. Its epicentre was only 34 km off the coast of the Ñuble Province. An estimated nine per cent of the Chilean population, and over 17 per cent of the population in the Ñuble region, lost their homes due to the earthquake and the ensuing tsunami. SOS Children’s Villages provided emergency relief, such as food, clothing, and basic hygiene products, to around 280 families, as well as offering emotional support. These emergency programmes were then gradually turned into self-sustainable development programmes run by the community itself. The earthquake did great damage to the region’s infrastructure and the consequences are far-reaching. The destruction of innumerable shops and companies meant that many employees were laid off – and some no longer even have a home to return to. This led to a big migratory flux to other cities. Several small towns were abandoned entirely, with residents fleeing to the hills in fear of further tsunamis. Hundreds of small farmers and business owners lost everything in 2010. Animals were killed, harvests destroyed, and forest fires demolished thousands of hectares. The regional government of Ñuble has created an emergency fund to help people get back on their feet, but hundreds of families remain in a desperate situation. Migration to a larger city may seem like the only option to them, but there is no guarantee that their lives will improve once they arrive there. Infrastructure may not be in place, or they may not be able to find work. SOS Children’s Villages supports families in rebuilding their livelihoods in the area so that they do not have to leave their homes behind, and so their children can grow up in a stable family. SOS Children’s Villages began its work in Bulnes in 1969. Today, our social centres here offer a family strengthening programme, which aims to alleviate hardship in the community in a holistic and sustainable manner. The centres’ services include day care and a childminding programme for over 600 children, which allow parents or single mothers to leave their children in safe hands while they are out making a living or looking for work. A seminar room provides space for adult training, which can be organised according to the community’s needs. There is also a paediatrician, a dentist and a pharmacy, and basic medical care is provided to the local community. 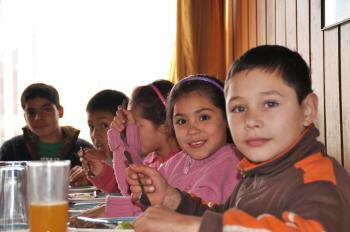 For children in Bulnes who are no longer able to live with their parents, 9 SOS families can provide a loving home. In each family, they live with their brothers and sisters and are affectionately cared for by their SOS mother. The children attend local schools and are therefore very much integrated into the community. When young people from the children’s village are ready to leave their family in order to pursue further education or vocational training, the SOS Youth Programme provides shared accommodation for young people from the Children's Villages Bulnes, Concepción, Chaimávida and Puerto Varas. The young people come and live together here and, with the support of qualified counsellors, they can learn to take responsibility, plan their future and prepare for independent adult life.